Temperature: 49 deg. wet/dry 50.0 deg. One of the RAINIER’s boat launches going off on a beautiful day in SE Alaska. Today I was invited to ride along to Sitka to pick up four crew members and the mail. The day was beautiful and the boat ride was terrific. 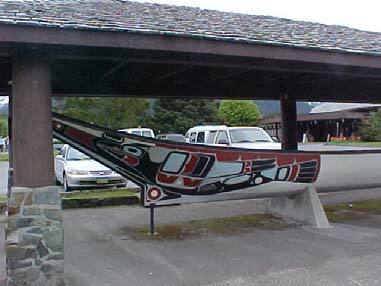 Sitka has been a part of Alaskan history for a long time. 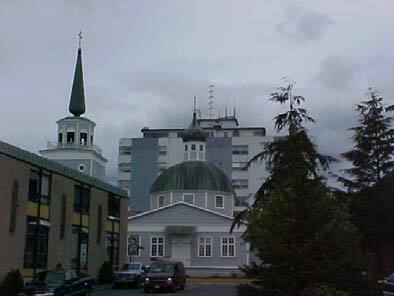 The Russians were the 1st Europeans to settle at Sitka. It was also where Russia turned over Alaska to the U.S. after the purchase by Secretary of State Seward. It was an early capital of Alaska before moving to Juneau. The harbor and city were spectacular, off in the distant background was Mt. Edgecumbe. Three of the crew we picked up will be returning to the RAINIER after leave. The other passenger has just finished NOAA Corps officer basic training and will be boarding the RAINIER for the first time. ENS Tim Smith will begin his career with NOAA aboard the RAINIER. Tim is a native of Rhode Island. Today was a spectacular day in SE Alaska full of warm sunshine, calm winds, and calm water. Later in the day it began to cloud up but the winds remained calm. On the way to Sitka I was able to observe dozens of sea otter, a sea lion, and a porpoise. Sitka looks like a picturesque town and popular tourist location for large cruise ships. There was a large cruise ship in the bay when we arrived. The surrounding mountains and the backdrop of Mt. Edgecumbe makes for beautiful landscape photos. How many ships are in the NOAA fleet? What is the name of the 2 ships that do hydrography in Alaska? Approximately how many glaciers does Alaska have? What is the capital of Alaska? What is the capital’s latitude and longitude? When did Alaska become a state? After a dip at the Hot Springs, back to the RAINIER paddling a kayak in calm waters. Present weather: Scattered cirrocumulus clouds, sun shining brilliantly – It’s a beautiful morning in SE Alaska. Temperature: 49 deg. wet/dry 50 deg. Earlier this week I went out on launch RA 6 to run some lines off Biorka Island. The weather was a little dreary and cold but made much warmer by the crew, which consisted of Chief Boatswain Steve Foye, AB (Able Body Seaman) Leslie Abramson, and LTJG (Lieutenant Junior Grade) Nicola Samuelson. Seas were a little rough running between 4 and 6-foot swells, but the crew did an excellent job staying on their lines and completing the task assigned. Conditions are not always ideal, yet the job must still be done. If seas are too rough the crew will head to a bay or protected area that still needs to be worked. Steering a boat in rough sea conditions isn’t easy. Chief Foye was on board to assist AB Abramson if needed. 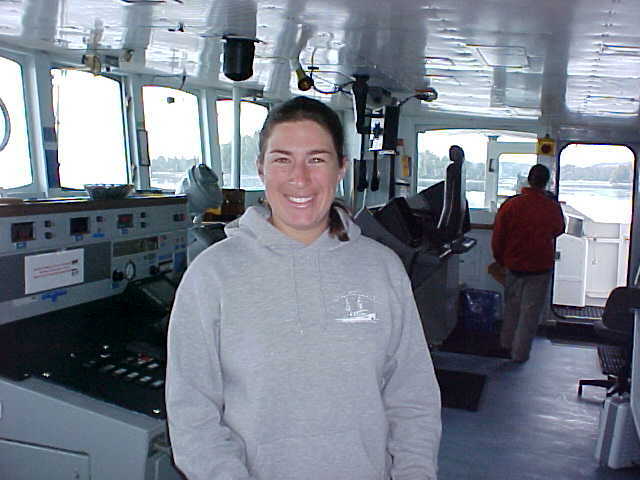 Leslie did an excellent job controlling the boat while down below LTJG Samuelson was collecting the data from the sonar. LTJG Samuelson has finished her 2-year assignment with the RAINIER and will be heading to Rhode Island for her next duty station when we reach our next port stop of Juneau. This day was an interesting one. I learned when you feel nausea or seasickness it is better to eat something even though you don’t fell like doing so at the time. 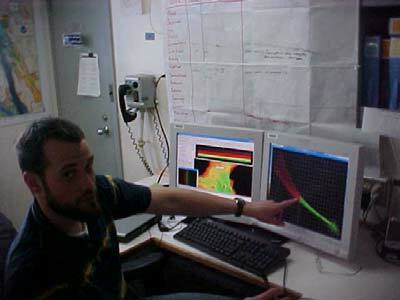 I really enjoyed learning so much about the day-to-day data collection techniques used by the crew of the RAINIER. The equipment is quite sophisticated and the people using it are very well trained. LTJG Samuelson was very helpful in explaining how the data is collected, stored, retrieved, and used to make the nautical navigation charts that NOAA publishes. The boatswain crews are well trained and do a good job piloting the launch boats through strong tide currents, rocky coastlines, and even rough seas. How deep is a fathom? When a ship anchors there are red, white, and blue chain links to show how deep the anchor is. What is the length between these colors called? How long is this length of chain? How much does one anchor on the RAINIER weigh? How much does one marked length of chain weigh on the RAINIER? What is the keel of a ship? What is meant when people are talking about a ship or boats draft? What does it mean when a ships bell rings continuously for 5-6 seconds every minute when it is anchored in open water? Thanks to Ordinary Seaman Megan Guberski for helping me to pose and answer some of these questions. Temperature: 48 de. wet/dry 50 deg. Today I visited the plot room. It is always a busy place. 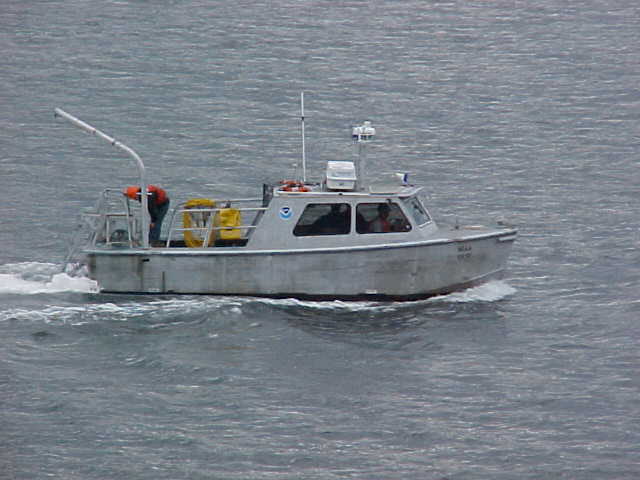 After the data has come in from the launch boats which have run the lines they were assigned for that day, the data is then downloaded to computers for processing so that accurate navigation charts can be made. Nick Gianoutsos and Shawn Gonzales both showed me how they clean up the data so it can be processed to make charts of the bottom of the channels, narrows, and waterways used by navigators throughout Alaska. The final product must both be accurate and reliable so that ships can trust the charts they are reading and using to plot navigation points and travel safely through hazardous coastal areas. Wrangell Narrows is where the data has been being collected from for the past couple of weeks. Wrangell Narrows extends almost 21 miles from the Sumner Strait to the south up to Frederick Sound to the north, near Petersburg, Alaska. The channel is very narrow in places, with dangerous ledges and strong tidal currents, and can be a treacherous waterway for larger boats if not marked and navigated properly. Cruise ships, Alaska State Ferries, tugs and barges, freight boats, pleasure boats, and commercial fishing boats navigate the channel. Some of the cargo that travels through the Narrows includes: lumber products, fish products, petroleum products, provisions, and general cargo. There are no roads to Petersburg, so everything has to come by boat or plane. The narrows can be a busy place for traffic in this area of Alaska. All known dangers in the Narrows are charted and most are marked. The mean range of the tide is 13.4 feet and diurnal range is 15.7 feet at Petersburg. 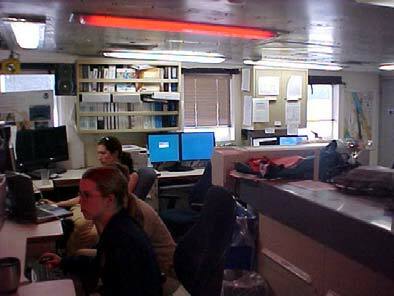 Members of the crew aboard the NOAA ship RAINIER are entering and analyzing data from the survey lines run from the launch boats during the day. This data will give an accurate indication of what lies below the water and also what lies above it. 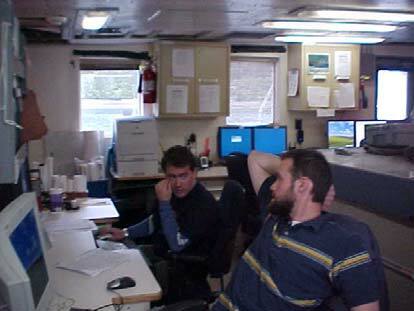 The crew aboard RAINIER keeps working, long after regular work hours are over. Crunching the numbers from a launch into useable data for charts for navigation. Today I was privileged to see a part of Alaska, Biorka Island, which is northwest of where we were near Petersburg in the Wrangell Narrows. The change of scenery was exciting and nearby are hot springs which are very warm and relaxing according to some of the crew who spent time there after hours. Using the information from log #4, which was Thursday’s log, how long will it take a ship that travels at 15 knots per hour to transit 231 miles? Temperature: 48 deg. wet/dry 48 deg. The same day I flew into Petersburg and boarded RAINIER Milton Ellison from Michigan arrived to begin his new job as a general vessel assistant (GVA). He has spent 8 years in the Navy and several more years in the civilian workforce. Milton has signed on to finish up retirement with NOAA. There are ten crews members aboard the RAINIER that make up Electronics and Engineering departments. NOAA provides many opportunities for those eager to experience new adventures. The stewards always have a good variety of delicious food. We are anchored in Hot Springs Bay, another beautiful view of the Alaskan coastline. Mt. Edgecumbe is in the distant background giving spectacular panoramic views of the area. The crew was able to visit the hot springs in the area last night. Today we will run lines around Biorka Island in the launch boats. 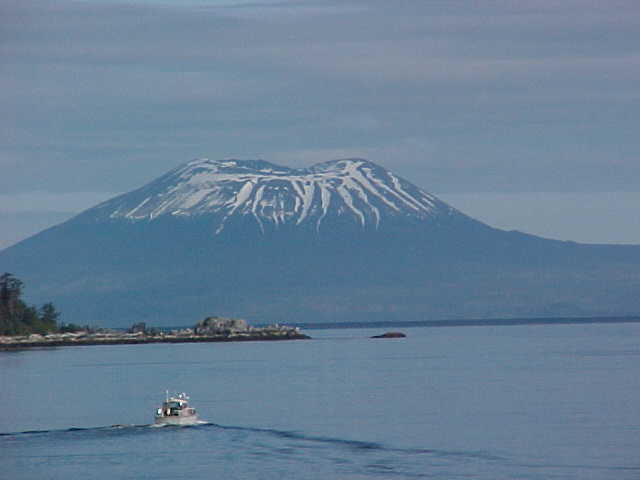 What is the name of the large volcano on an Island just to the northwest of Biorka Island near Sitka? Is the volcano active or dormant? How high is the volcano in elevation (ft.)? What is the latitude and longitude of this volcano? What is the highest peak volcano in Washington State? How high is it? What ship in the NOAA fleet is named after it? Temperature: 46 deg. wet/dry 46 deg. Yesterday I was invited out on a boat launch with LTJG Abigail Higgins, Junior Survey Tech Tonya Watson, and Deck Utility Man Kenneth Keys. We were sent out to set a couple of buoys to mark locations where divers from the RAINIER could go down later in the day and take a closer look at some peculiar features from the sonar soundings. We also had to run a couple of survey lines around an object near Petersburg Harbor on something peculiar Captain Guy Noll had spotted in the sonar record. I was able to pilot the launch for part of the trip and DU Keys gave me a quick course on navigation around marked points in the Wrangell Narrows. This was really cool! LTJG Higgins showed me how the boat collects data to take back to the RAINIER where it is processed to be used on navigation charts. When on a boat launch you may have to take lunch with you because you will not be back to the RAINIER in time for lunch. The skies were clear and full of intense Alaskan sunshine, which makes it feel warmer than the actual temperature outside. It was a beautiful day enjoyed even the more by having lunch on the boat. When the launch boat returns to the RAINIER the data is downloaded to the ships computers where it is processed so that charts and graphs can be made or updated. Below physical scientist Shyla Allen from the Pacific Hydrographic Branch assist ENS Laurel Jennings in making plans for running lines at the next stop near Sitka. 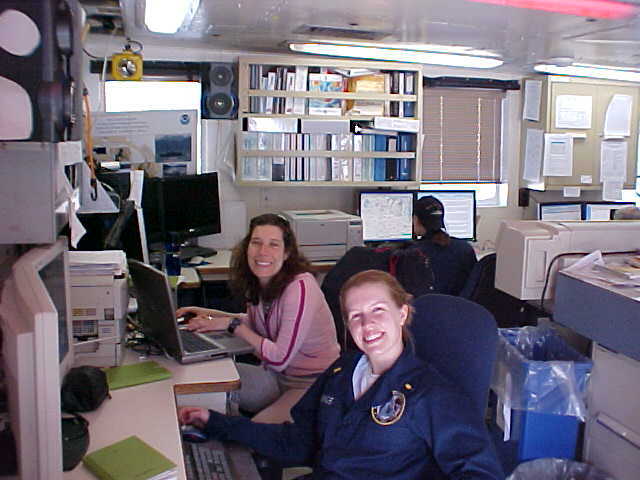 ENS Jennings is in her first year on the RAINIER and a part of the NOAA officer corps aboard the RAINIER. Today was an absolutely beautiful day in SE Alaska. 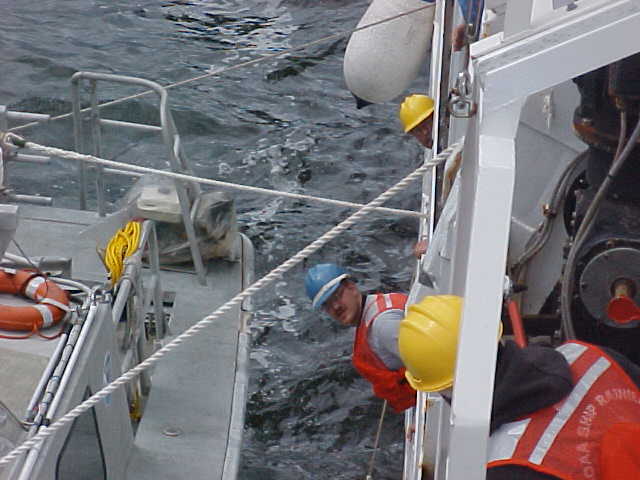 I really enjoyed working with the survey technicians and people aboard the RAINIER. I have learned much more than I thought ever existed when comes to navigating the waters, coastlines, and harbors of Alaska. 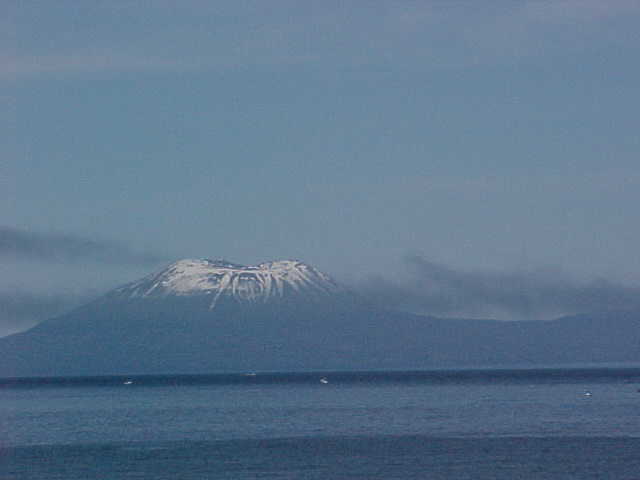 Today we are traveling to Biorka Island, which is northwest of where we were the previous week. When approaching a green buoy from sea in a channel in North America which side should your boat approach on? When approaching a red buoy from sea in a channel in North America which side should your boat approach on? Plot a course if you were the pilot of the RAINIER that you would follow from Wrangell Narrows near Petersburg to Biorka Island. several of the deck crewmembers recovering RA 1 back to the RAINIER for the day. Temperature: 50 deg. wet/dry 52 deg. Steve Foye, Chief of the Deck Crew and admirer of nature! As you can tell it takes a lot of people working together to make sure the RAINIER gets boats in and out of the water, to their destinations, and ready for the next day. The crew aboard the RAINIER are very skilled in what they do. Steve is also very interested in the local wildlife, marine mammals, and fauna of the Alaskan coastline. He has had many years of experience in identifying the wildlife of this area. Anytime there happens to be wildlife near the ship, Steve is quick to tell me about it so that I can photograph the animals. Chief Foye has a wealth of documents from the Alaskan Wildlife and Fisheries Department that help to identify the varying wildlife in the area. While onboard the RAINIER I have had the opportunity to view three Northern Sea Lions, two Alaskan Black Bears, numerous Sitka Black-Tailed Deer, a Dall’s Porpoise, many species of ducks and other birds, including the American Bald Eagle. I’ve only been aboard for 5 days and have taken numerous photos of local wildlife that I can share when with students when I return to Oklahoma. Chief Foye has sat down with me to help me identify all the wildlife I’ve seen so far and pointed out some that he still expects to see on our way to Biorka Island. Tomorrow we leave for Biorka Island and I am told that there is a good chance we will spot various species of porpoises and maybe a few whales. We should arrive at Biorka Island sometime Saturday afternoon where the crew will begin readying their plans for running lines of that area. Today I roamed through the ship talking to people aboard the RAINIER with various jobs. I learned many specifics about each of the crew and their responsibilities and also learned a little about them personally. The RAINIER has a good mix of people who seem to work well together. All the crew’s members have treated me very well and I am enjoying my time aboard the RAINIER. Can you name 10 marine mammals that can found in Alaskan waters sometime throughout the year? Can you name land mammals that can found in Alaska? Can you name 10 bird species that live or migrate to Alaska? 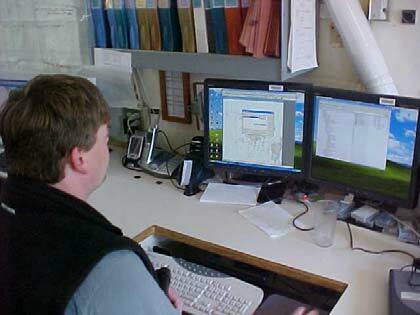 ENS Nathan Eldridge logging weather data to be sent to NOAA for analysis of the area. 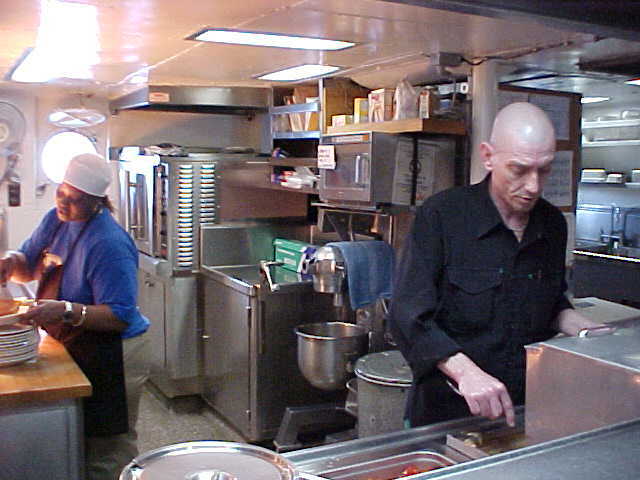 After completing breakfast I spent the rest of the morning on board the RAINIER and visited with the crew on some of their duties on the ship. At 1000 hours I had a briefing on the bridge with Nathan Eldridge on how the RAINIER collects weather data every six hours that it then sends to NOAA so that, the data can be used by meteorologists for weather observations and predictions. 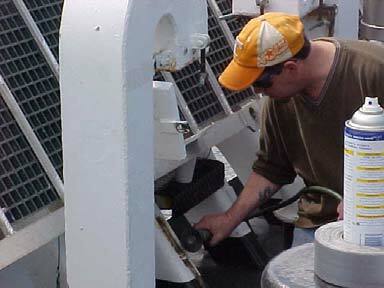 Nathan has been aboard the RAINIER since Nov. of 2005, so this is his first full season at sea. Nathan is an ensign signified by the acronym ENS. 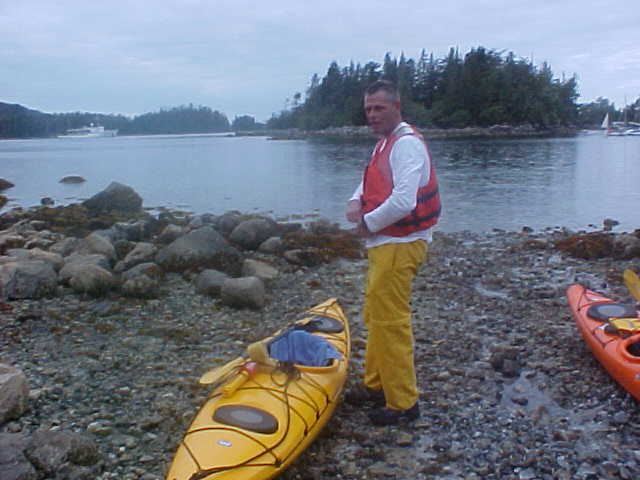 He attended the NOAA Corp’s program for officer training before coming aboard the RAINIER. 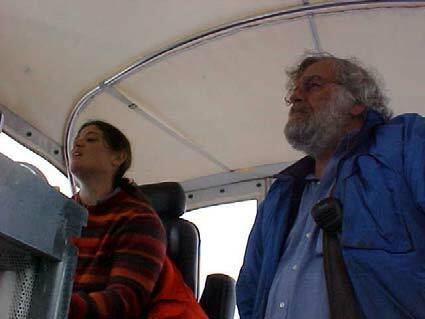 ENS Sam Greenaway explains navigational charts. 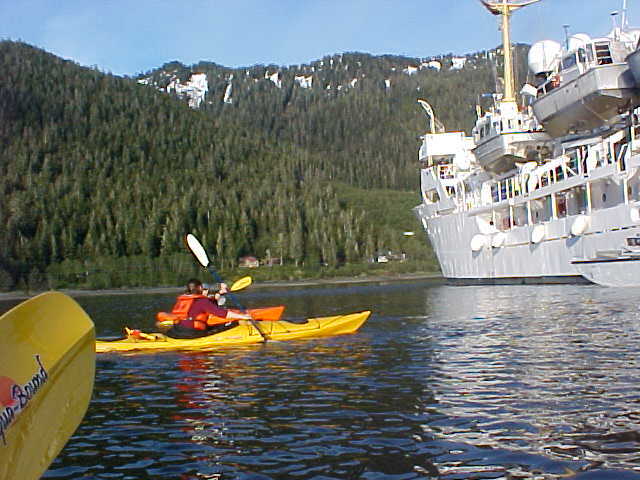 Navigation is crucial to the ships through the Alaskan waterways. 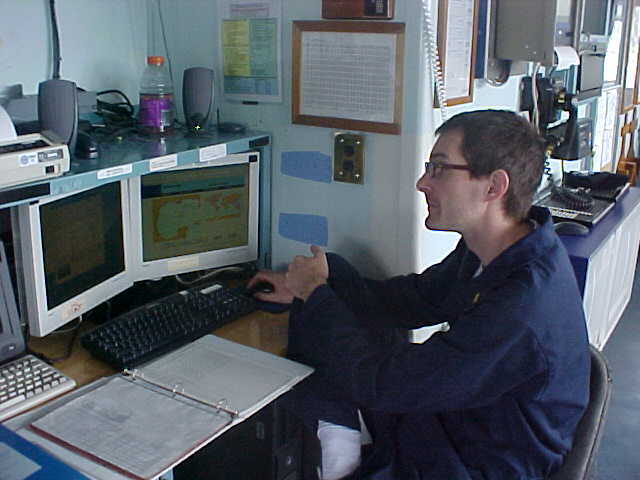 ENS Sam Greenaway has been aboard the RAINIER since Nov. of 2004. 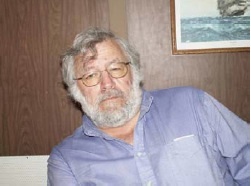 Sam is the ships navigation officer and plots paths through the Alaskan waterways. 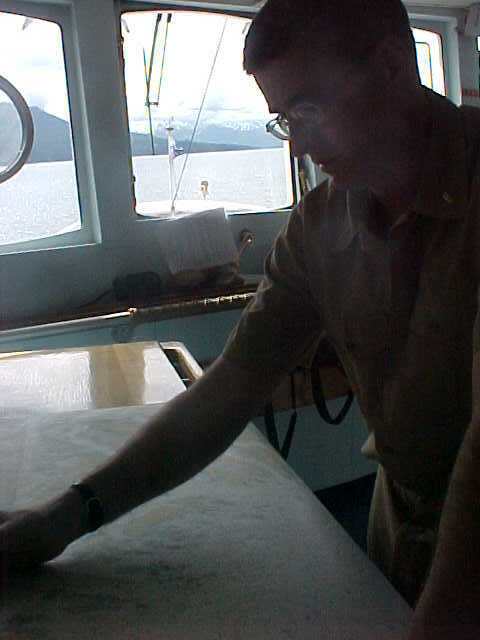 There are many things to read on a navigational chart, a good understanding of the charts allows Sam to plot a safe and direct path to the location at which the RAINIER will anchor next. The ship will be leaving Wrangell Narrows for the Biorka Islands in the next day or so. Last evening I was invited by the XO, Julia Neander and AB Leslie Abramson to go kayaking in the Wrangell Narrows just before dusk. The water was calm and the sun was slowly disappearing behind the snow-capped mountains. The trip was very tranquil and serene. I enjoyed the experience immensely. The crew aboard the RAINIER are very helpful and assist me in any way they can to make my stay as enjoyable and productive as possible. What is the Beaufort scale and how is it used? What is the difference between a nautical mile and a statute mile? What is the difference in speed between miles per hour and knots per hour? What is the length of a fathom?